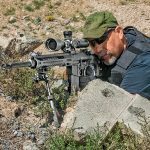 Lewis Machine & Tool’s hard-charging ARs give operators and competitors an on-target edge with every shot! Lewis Machine & Tool offers the LM8MWS with several optional barrel assemblies in various lengths that include low-profile gas blocks and gas tubes. Shown with a Bushnell Elite Tactical 4.5-30x50mm XRS riflescope and an Atlas bipod. 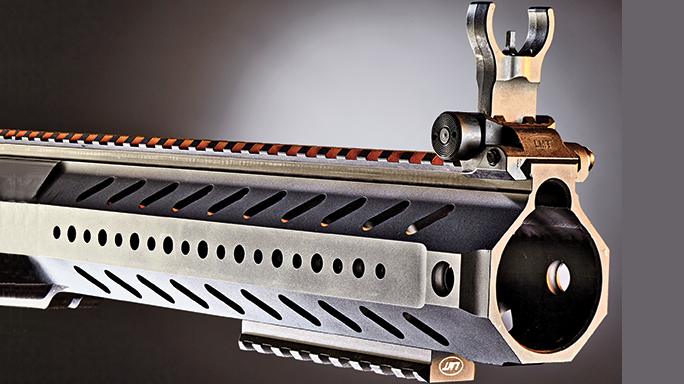 LMT’s “slick” monolithic upper features a free-floating forend that can be customized with rails. 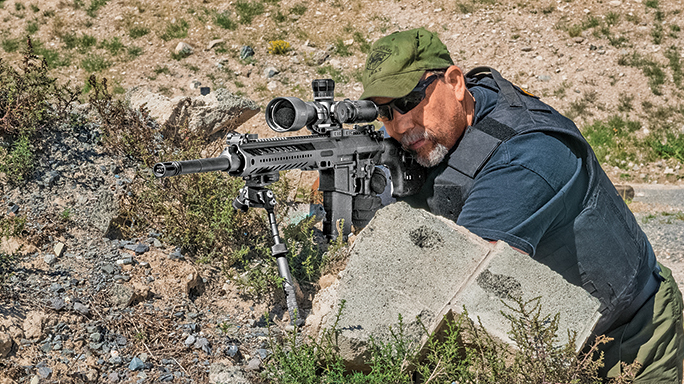 Lewis Machine & Tool has been building rifles geared toward use in the harshest environments for years. Built to withstand hard use, many of the company’s designs have professional operators or competitors in mind. Its 5.56mm LM8MRP popularized interchangeable barrel systems by allowing simple, quick conversions to various barrel lengths and calibers. Its patented monolithic upper was an industry first and set the standard for years to come. Machining the entire part from one billet eliminates stress points and more easily facilitates barrel changes. Proven in the 5.56mm platform, the company has transitioned into making 7.62mm rifles as well, and the results are pretty impressive. The LM8MWS in 7.62mm NATO includes an ambidextrous safety and mag release, and both the upper and lower receivers are forged. The two-stage trigger group is robust, crisp and clean. An Ergo rubber grip provides a firm and comfortable hold, while adjustable LMT SOPMOD stocks are standard on the design, although the company’s new DMR stock is also available. All of the remaining internals are mil-spec. The monolithic upper receiver is solid, strong, well built and features a continuous top rail. Smooth, slender lines allow for comfortable holds and a very nice look. Mounting holes at 3, 6 and 9 o’clock provide ample space for rails, and covers for unused space provide a solid hold. 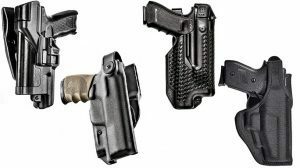 Sitting atop the rail are LMT’s newest folding sights. Folding flat and locking firmly in place with one hand, these units are rock solid. Two bolts hold the barrel in place and provide a nice flat spot for unsupported shooting. Several quick-detach (QD) slots are provided for sling use. Barrels chambered in 7.62mm are available in 16-, 18- and 20-inch lengths. Most are stainless steel, match-grade units with 1-in-11.25-inch twist rates. There is also a 16-inch, chrome-lined, 1-in-10-inch-twist barrel available for those needing a short carbine. 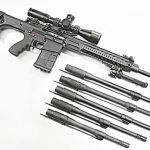 Other calibers/barrel assemblies include 6.5 Creedmoor, .260 Remington, 7mm-08 and .243 Winchester, all with 20-inch, stainless steel barrels. LMT cryogenically treats each barrel to increase accuracy, barrel life and facilitate easier cleaning. Each has a robust, low-profile gas block and gas tube. All barrels are capped with an A2-birdcage-style flash suppressor and feature 5/8×24 threading, allowing for the addition of aftermarket muzzle brakes, flash hiders or suppressors. An LMT 308D hard-chromed, semi-auto bolt carrier group is also utilized in the rifle’s design, ensuring reliable operation in most any condition. Accuracy with the 6.5 Creedmoor barrel assembly was impressive. My best group measured 0.5 inches. Recoil was minimal, causing little to no movement, prompting me to also conduct group testing with just the iron sights. These new sights lend themselves to consistency, and with a 0.95-inch group at 100 yards, they were clearly excellent. Since 7.62mm is the most common caliber in this platform, several of these loads were also tested. All were accurate. The M118 LR grouped at a tad over half an inch. Everything else was under 1.5 inches, with most hovering around the 1-inch mark. Moving back to the iron sights, the LM8MWS was tested from various shooting positions, around obstacles and with various types of ammunition. This rifle’s sight design facilitates really fast shots up close—line up the circles and press. A standard AR post allows switching to tritium. The rear sight features a post that can be turned to adjust for different ranges with both a small and large opening. Windage can be adjusted using a knob on either side. Designed for a 300-yard zero, it has a built in bullet-drop compensation (BDC) with large white markings. Just for kicks it was taken out to smack some steel using the BDC. Once the wind was worked out, hits at 500 yards were pretty regular with it dialed up to “500” on the sight. As backup sights go, these are excellent. Swapping out barrels is simple, fast and requires one tool—the proper Torx wrench, which LMT provides. During testing I loosened the screws holding the barrel in place as much as a turn with no change in the point of impact. Removing and replacing a barrel generally yields little to no change, especially if you torque the bolts properly. Reliability was excellent with every barrel, and ejection patterns were impressive. In the prone position, with consistent pressure in the pocket, it created a tidy pile in the same place with all the ammunition. 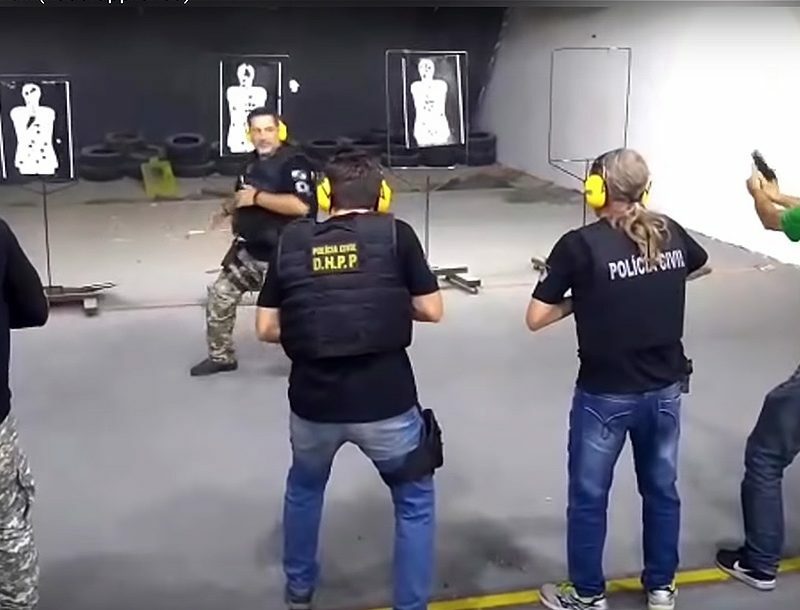 The ejection pattern was a bit less regular in rapid fire, but the rifle was completely reliable. LMT offers the LM8MWS in several configurations. Offered in barrel lengths as short as 16 inches, they are built to meet restrictive state requirements, including California. 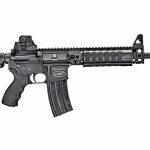 The company’s SLK receiver offers a smooth handguard with various places to attach rails of varying lengths, providing for the most versatility. Standard receivers have built-in quad rails with covers for unused space and a comfortable grip. 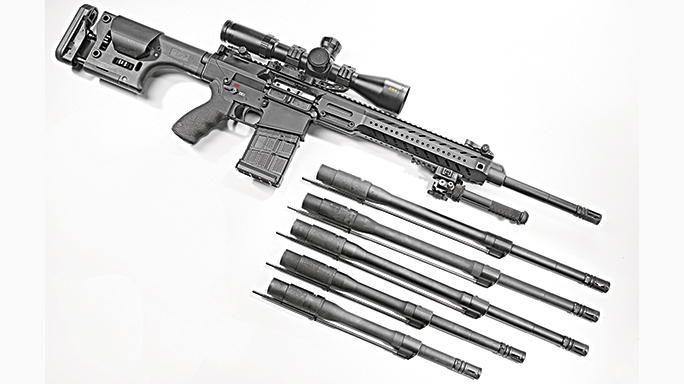 For those looking to have it all, the Sharp Shooter Rifle package (LM308SS) provides the rifle with a 16-inch, match-grade barrel, flip-up sights, eight 20-round magazines, a sling, a cleaning kit, a sight adjustment tool and the torque wrench for barrel changes, all packed in a custom-built Pelican hard case. LMT’s proven line of 5.56mm rifles covers just about every need in both piston-driven and direct impingement platforms. The company’s Defender line anchors its direct impingement models. The Defender Patrol model uses a chrome-lined, 16-inch barrel with a flattop, a rear sight and standard A2 features typical of mil-spec rifles. Adding a SOPMOD stock and Ergo grip fills out the standard model. compliant models available in this lineup. Each has quad rails with covers. Looking for a competition rifle or just more versatility? The SLK series has you covered. 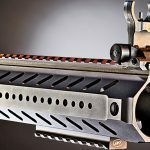 The featured SLK handguard allows for complete control with a slick side and various rail attachments. This lets the operator keep it simple or add aiming aids, lights or night-vision optics. Barrels range from 16-inch, chrome-lined units to Ultra Match Stainless barrels as long as 20 inches. If you prefer a piston-driven system, then the CQB MRP, part of the Defender series, is the ticket. Barrels range from 12 to 16 inches in 5.56mm, and 16 inches in 6.8 SPC. 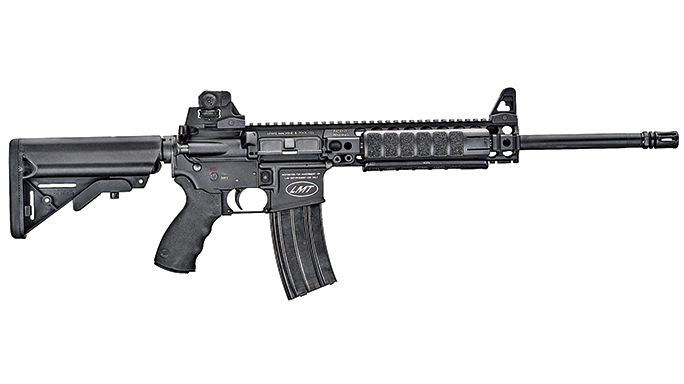 Using the MRP system, one rifle offers interchangeable barrels and calibers. Just swap out the barrel and bolt and you’re ready for action! 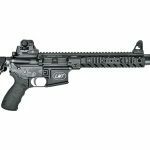 If you are looking for some of the highest-quality AR rifles built with the strongest and most versatile receivers available, LMT is the place to start. The company remains the standard in monolithic design and is an industry leader when it comes to interchangeable barrels and calibers. 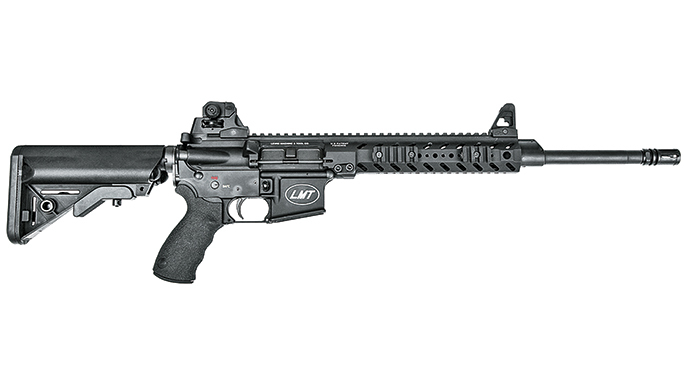 Whether you’re looking for a simple duty rifle, long-range precision or a competition machine, LMT has what you need. For more information, call 309-732-9527 or visit lmtdefense.com. Tank-tough security holsters that offer fast access with maximum control!